Most consulting or design firms communicate with their affilites only through fax or email. At BIGEyes Marketing, we understand the importance of effective communications and have complemented our phone, email, and fax communications with our web based design studio. Here, affiliates can login with a secure username and password and communicate directly with the BIGEyes Marketing team, track their affiliate account, and order additional products or services. 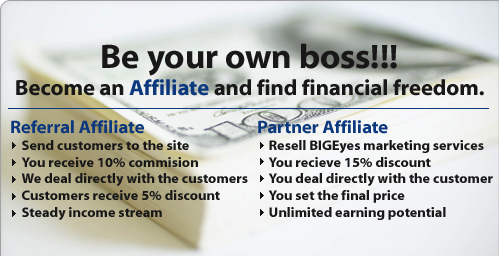 Login now to view your affiliate account. Don't have an affiliate account? Click the Sign Up button below to get started.